This March, Biyahe ni Drew dares all biyaheros to leave their comfort zone, review their travel bucket lists and TRY SOMETHING DIFFERENT! 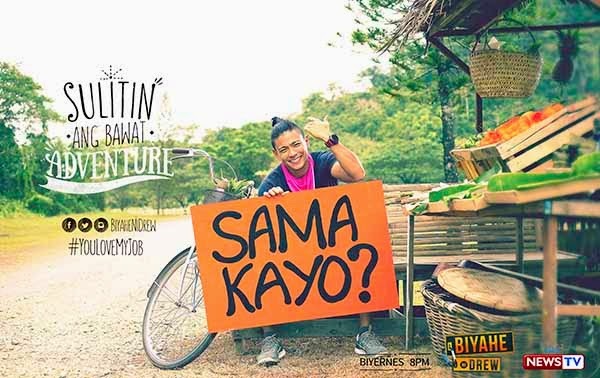 Professional traveller and most recent DOT’s Tourism Star awardee Drew Arellano goes to four scenic and memorable locations to celebrate Biyahe ni Drew’s 2nd anniversary. To kick off this month-long anniversary celebration, Drew goes surfs up on the famous Cloud 9 of Siargao. Here, he discovers that the famous surfing destination has a lot more to offer than barrelling waves. It also features unique rock formations where daredevils can cliff dive. In Magpupungko Beach, there are natural pools where one can leisurely swim. There are also dune buggy and crocodile hunting tours for those looking for an extra rush of adrenaline. Drew tries cowboy livin’ among the cattle herders of Bukidnon as he heads to Northern Mindanao for a taste of something different. Here, Drew finds out that there’s a lot more to raising cattle than meets the eye. Aside from visiting famous landmarks in Bukidnon, the self-confessed caffeine lover also discovers the secrets to creating the full-bodied flavour of the famous Monk’s Blend coffee. As dream destinations go, the private islands in Palawan probably top many travellers’ bucket lists. 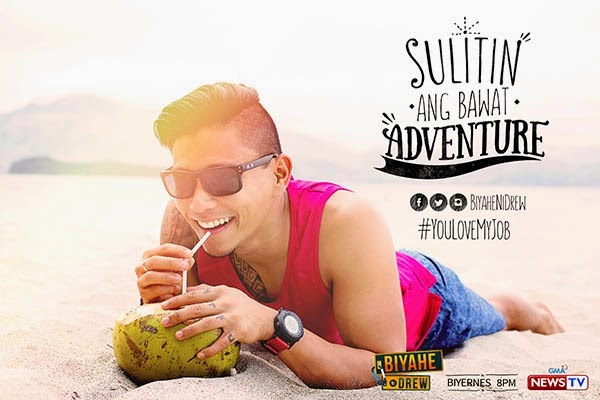 This year, Drew gets to experience the “good life” as he lives it up in secluded, exclusive hideaways in Palawan for Biyahe ni Drew’s special feature. This is the kind of trip that one would do in a heartbeat if money was no object. Travelling via private sea plane, island hopping via private yacht, having a staff of 30 at your beck and call and “owning” an island for a few days... certainly a trip of a lifetime. Drew escapes the Philippines’ summer heat by cooling off in Hokkaido, Japan for a “winter wonderland” special. For the first time in Biyahe ni Drew, Drew goes to Niseko, the most famous ski resort in Japan, known for its light powder snow where he tests his skiing/snowboarding skills. Biyahe ni Drew’s 2nd anniversary special will air from March 6 to 28, 8pm on GMA News TV!